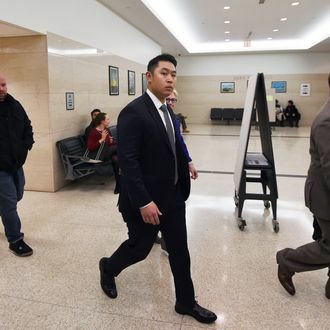 On Monday morning, the first day of NYPD Officer Peter Liang’s trial, prosecutors played a 911 call made after Liang shot 28-year-old Akai Gurley in November 2014. On Tuesday morning, the two police officers who responded to the scene after the shooting testified, as did Lopez’s husband, Miguel Riveria. He said that he heard Liang’s partner ask the officer to call in the shooting repeatedly. Officer Salvatore Tramontana said that he didn’t have his gun out when entering the stairwell, and that he immediately began doing CPR on Gurley, taking over from his girfriend, when he arrived, something that neither Liang or his partner had managed to do. Officer Andre Fernandez added that Liang looked “absent” while all this commotion was taking place. Gurley and his girfriend had allegedly tried to take an elevator, but it was taking too long. The shooting has been linked to the deaths in Ferguson and elsewhere by activists, and the indictment happened at nearly the same time that grand juries decided not to charge officers involved with the deaths of Michael Brown and Eric Garner. Today in Cleveland, six police officers were fired over a police chase four years ago that led to the deaths of two unarmed civilians. At least 137 shots were fired at the two people. Some believe that Liang may decide to testify later in the trial. The jury will have to decide if Liang was right to have his gun out in the stairwell.